DUBOIS – Alcohol, Tobacco and Other Drugs (ATOD) Awareness Day was held on campus on Tuesday, April 11. The long-standing tradition among students in the Counselor Education courses at Penn State DuBois aims to educate students about the dangers of substance abuse. Students in this semester’s Counselor Education class developed and facilitated the ATOD event, which included educational games, local vendors, prizes and food. 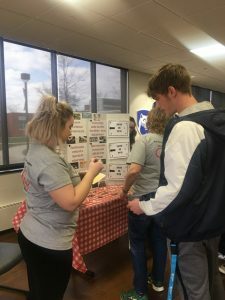 The campus community was invited to learn about various drugs of abuse, the impact of living with a substance use disorder and local resources students can connect with to receive help for themselves or a loved one living with addiction. Due to the increasing rates of addiction and death related to substance overdose across the nation, the students in the class wanted to advocate for those who may be struggling with an addiction. The students chose the theme of “Backyard BBQ,” which ties into the concept that addiction is in our backyard. “Despite the lack of discussion surrounding addiction, substance abuse is a growing issue in our own rural community,” said Jessica Clontz, lecturer in Human Development and Family Studies. DuBois Emergency Medical Services also attended the event and educated participants about the administration and usage of Narcan, a drug used to reverse an opiate overdose. The Clearfield Jefferson Suicide Prevention team was also present to inform participants about the correlations between suicide attempts and substance abuse. “The students facilitating the event have worked hard all semester to prepare creative and educational games regarding the opioid epidemic, harm reduction strategies, myths surrounding addiction and the effects of substances on the body. The event was a great success and engaged many students across the campus,” Clontz said.